Captain Scarlet walked slowly down the corridor, alert for any clue. Like everyone else on Cloudbase, he was combing every inch, looking for the slightest thing out of place. Doctor Fawn’s Laboratory – nothing. No matter where he looked, he’d come up with the same. Johanssen just had to be around somewhere.He was just about to turn the corner into corridor twelve when his epaulettes flashed blue and his cap microphone swung down into position “Go ahead Captain Blue,” he said into the microphone. “Nothing so far,” replied Scarlet, “I’m just about to search corridor twelve though I -” his voice tailed off as a wave of nausea swept over him. It could mean only one thing – the presence of a Mysteron. Since he, himself, had once been under the influence of the Mysterons, an experience he had no recollection of, he had developed a sort of sixth sense, able to detect the presence of a Mysteron. It was this sense that was warning him now. He became aware that Blue was calling him. “I think I’m quite close to him,” he whispered into his microphone. Indeed, Johanssen was, at that moment, crouched behind one of the main power conduits leading to the hover combines. If, for any reason they were ever shut down, Cloudbase would plunge from the sky. Scarlet waited patiently until Blue arrived. The feelings of nausea had passed now. He placed his ear to the hatch, hoping to catch any sound that might betray Johanssen. Other than the sound of the machinery inside, he could hear nothing. Inside, Johanssen crouched, silent and motionless. Like a waxwork. Blue arrived two minutes later, closely followed by Captains Grey and Ochre. “Is he in there?” asked Blue breathlessly. “Well,” said Ochre, “there’s only one way to find out.” With that, he pressed the door release and hurriedly stood back. The door slid quietly back. There was no reaction. Drawing his gun, Scarlet led the way. The setting sun shone brightly through the porthole, casting brilliant reflections from some pieces of equipment and throwing others into deep shadow. The gentle hum of machinery filled the air. “You’re already too late Earthman,” called Johanssen. “Cloudbase is doomed.” The voice was clearly Johanssen’s, but under the control of the Mysterons, had an added note of arrogance in it. “What do you mean?” called Scarlet, a note of anxiety creeping into his voice. But there was no reply. Signalling the others to stay back, Scarlet slowly made his way further into the room, alert for any signs of trouble. Ducking behind some machinery, Scarlet crept slowly towards the point from which Johanssen’s voice had emanated. Not a sound came from the Mysteron. “S. I. G,” replied Blue faintly, “ I’ll bring a Mysteron Gun.” Blue was referring to the one weapon that could be certain of destroying a Mysteron. In fact, it had been here on Cloudbase, during the abortive attempt on General Tiempo’s life, that it had been discovered that high voltage electricity was capable of destroying a Mysteron. It had been a relatively straightforward matter to devise a weapon capable of harnessing this effect. “What are we going to do then?” asked Blue anxiously. “Good Luck Captain Scarlet.” Blue signed off. Johanssen sat motionless, giving no sign that he’d heard Scarlet.Scarlet moved closer “Mr Johanssen?” Still no reply. Scarlet reached out and gently touched Johanssen and when there was still no response, shook him. Scarlet hauled Johanssen to his feet. Indeed smoke was coming from Johanssen’s body and clothing in the same way it had just before Captain Brown had exploded. That explosion had been capable of destroying the Maximum Security Building. Scarlet had seen the videotape of those events and knew that this blast would certainly destroy Cloudbase. “What about you?” called Blue from the doorway. “Get out of here!” yelled Scarlet. “ There’s only one way to save Cloudbase now, and I’m the one to do it. See you later.” With that, he drew his pistol and took aim at the window. Blue suddenly realised what Scarlet intended and pressed the button to close and seal the hatch. As the hatch slid home, Scarlet fired. The sound of the breaking glass was drowned by the roar of escaping air as the room depressurised, blowing loose items of equipment out into the empty void outside. Scarlet and Johanssen were dragged toward the window by the air pressure. Closer and closer until finally Johanssen’s body disappeared through the hole and began to fall to earth. Scarlet scrabbled for a handhold to prevent himself from suffering the same fate. He grabbed for a stanchion and was just able to grasp it. Pulling himself upright, he could see out of the hole. The air pressure was decreasing now and he could hold on without too much trouble. Johanssen’s body was already a tiny dot in the distance. A dot which at that moment exploded into a huge fireball, the same way that Captain Brown had before him. “Strange,” thought Scarlet to himself. “It’s not as cold as I would have expected. In fact it’s quite warm.” Slowly he became aware of a pink mist that seemed to appear from nowhere. Faint singing filled the air. Captain Scarlet had been so engrossed with the view that he had failed to notice how thin and cold the air had become until it was too late. Gasping for breath, he lost consciousness and toppled out of the window. “How long was the President unconscious before he was discovered?” asked Jaeger, the Senior Consultant examining the unconscious figure of the President. “Do you think he’ll live sir?” asked the registrar. “It’s too early to say as yet,” replied Jaeger. “I doubt it,” replied Jaeger, holding the door open for his younger colleague. “I’ve seen exhaustion before, but it’s never been as bad as this. Perhaps you should ask him – if he recovers.” With that, he cast a final glance at his patient and then closed the door. The Security Guard snapped to attention as the two Medical men left the room. “I shall be sending a nurse in to look after the President,” Jaeger informed the guard. “Yes sir,” the guard acknowledged, saluting smartly. With that, the two medical men strode away down the corridor, leaving the guard to his solitary vigil. Colonel White’s hammering on the door had brought muttered curses as the Guard unlocked the door. Curses that died in his throat as his gaze fell upon Nielsen’s body. “Don’t just stand there man,” White had thundered at the guard, standing open mouthed at the door. “Do something!” The tone of Colonel White’s voice had shaken the guard from his shock. He fumbled for his radio and called for medical assistance. Doctor Harvey had arrived five minutes later. “He was dead before he hit the floor, Colonel.” The doctor looked rather uncomfortable as he made his diagnosis. “What was the cause of death, doctor?” asked White, glad that the doctor had done the decent thing and closed Nielsen’s blankly staring eyes. But White didn’t hear him. An appalling thought had just occurred to him. His own words echoed and re-echoed in his mind. “He was eating food from that plate, that plate…” The very plate that had been intended for Captain Blue and himself! “Anyway,” Harvey concluded, “I mustn’t bore you any longer with family anecdotes. I do have other patients to see to, hopefully,” he chuckled. “A bit more lively than Mr Nielsen there.” With that, he picked up his hat and left, followed by the guard, closing and locking the door after him. Colonel White fumed to himself. It was bad enough his defence lawyer dying in front of his eyes, having eaten food meant for his clients, without the doctor having to make a joke of it. On reflection, he mused, perhaps he had been rather hard in his judgement of the doctor. Although he, himself had had to come to terms with losing good men, even friends, to Death, that most relentless of enemies, it must be particularly hard for those whose training demanded that they battle to keep their patients alive no matter how long the odds. The joviality was just the doctor’s way of coming to terms with it. He turned and gazed out of the window. Dusk had fallen and the city was alive with a myriad of twinkling lights. The snowy peaks of the mountains glowed gently in the light of the moon, just beginning her nightly voyage across the trackless ocean of the night sky. As the red and purple hues of evening gave way to the velvet cloak of night, a red pin-point caught his eye. He shook his head sadly. “Mars, planet of War, and what a war!” he murmured quietly to himself. Lieutenant Green was surprised to hear from Colonel White and especially in such an abrupt manner “Cloudbase is approximately ten miles from Geneva, Colonel,” he replied. “I’m afraid Captain Scarlet is dead,” replied Green. “How did it happen?” asked White. Green told him everything that Captain Blue had told him. When he had finished, White was satisfied that, at least, Cloudbase was still operational, the broken window and equipment, lost when the room depressurised, could be replaced at leisure. “Where’s Captain Blue now?” asked White. The Spectrum Helicopter settled gently onto the snow-covered ground, the down-draught from its rotors kicking up a flurry of fresh snow. As the shimmering disc slowed down, Captain Blue jumped from the cockpit. “Tell Cloudbase that we’ve found him,” he called to Destiny Angel. He had to shout above the whine of the turbines. “S. I. G.,” she called back, smiling with relief. She was glad that Captain Blue had picked her to fly this mission. Captain Blue shivered and pulled his parka more tightly around him. His footsteps crunched in the freshly fallen snow towards the huddled form of his friend. He’d known that the fall from forty thousand feet would make a terrible mess of Captain Scarlet’s body, but his stomach still lurched when he turned the body over. It had been worse than usual. Steeling himself against his feelings, he unzipped the body bag that he’d brought with him and set to work. Nearby, two pairs of eyes witnessed the scene. They had just had time to get under cover before the Spectrum Helicopter had swooped into the valley, its rotors slicing the silence of the night and echoing from the mountain peaks. They saw Captain Blue finish his grisly task, pick up his burden and carry it to the waiting helicopter. Moments later, the Spectrum Helicopter lifted noisily into the air and flew away. As the sound of rotors faded away, the two watchers stood up. “You know what you must do?” asked Captain Black, his voice a lifeless monotone. “The Mysteron Instructions will be carried out,” replied the newly created Mysteron. With that, the two figures toiled up the snow-laden slopes to where Black’s car was waiting behind a small outcrop of rock. They got in and drove away. “S. I. G.,” said Blue, breaking the channel. Destiny knew, on seeing Blue’s face as he climbed back into the helicopter, that Scarlet was in a bad way. “Captain Scarlet, he will be all right?” Destiny had asked Blue. That thought had served to comfort Destiny during the flight. Blue, too was lost in thought. He wondered exactly how long Scarlet’s injuries would take to heal. He had the distinct feeling that the shorter the time that Captain Scarlet was out of action, the better. Had anyone been able to look inside the engine compartment of the helicopter as it winged its way home, they might just have noticed two pale circles of light come to rest on the turbine casing before blinking out of existence. The effect was dramatic. A turbine blade snapped off at the root and smashed its way through the casing, severing fuel lines and electrical circuits. The first that the occupants of the helicopter knew was the dull thud as the fuel exploded. “Mon dieu!” Destiny gasped, “I have lost control!” Indeed, the helicopter began to plunge earthwards, a long ribbon of flame and smoke streaming out behind.As Destiny struggled with the controls, Blue desperately tried to contact Cloudbase. No reply. Obviously, the radio had been damaged by the explosion. Narrowly missing a mountain crag by inches, the blazing helicopter plummeted, like a barely guided missile, into a snow-filled valley. Seconds from impact, Destiny gave a final, desperate, pull on the controls. The nose of the helicopter began to rise as the madly spinning blades bit into the air once more and began to provide lift. But it was too little, too late. With a splintering crash, that echoed through the airframe, the tail clipped a tree top. The nose dipped again and the helicopter hit the ground, the landing skids snapping like matchwood. The wreck slid along the ground on its belly, ploughing a giant furrow in the snow and finally coming to rest in a snow-filled hollow. Silence once more settled upon the valley. Captain Blue was the first to regain consciousness. He offered a swift vote of thanks to the designers of the safety harness that had saved him from injury in the crash. He undid the harness and leaned over to check Destiny. She was still unconscious. There was a nasty looking gash on her forehead but fortunately it had stopped bleeding. Once more he tried the radio. Nothing. Pulling down the microphone, he tried his personal radio, built into his cap. Still no reply. Blue stood up and immediately fell to the deck with a gasp as the searing pain from his ankle lanced upward. He sat up. To remove his boot in order to examine his ankle would be foolish. Even if only sprained, it would swell, preventing him from putting his boot back on. Walking barefoot in the snow, he knew, would be extremely foolhardy. Gingerly, he stood up, using the back of his seat for support. Gently putting weight onto his foot, he decided that his ankle was badly sprained, rather than broken. With a bit of luck, his boot would help to support it. Limping painfully, he made his way back to the rear of the cabin to examine Scarlet’s body. Although he was not yet breathing, the worst of the cuts and abrasions had healed. Blue had never ceased to be amazed at his friend’s recuperative powers. Once more he zipped up the bag and then slowly made his way to the exit. A combination of the cold and the impact had jammed the hatch. Try as he might, Blue could not budge it. There was nothing for it, he decided, He would have to blow the hatch. Flipping open a panel marked ‘EMERGENCY HATCH RELEASE’, he pulled the handle inside. With a sharp crack, small charges detonated, hurling the hatch free. The concussion knocked an already shaky Blue off his feet. His ears rang as his head hit the bulkhead behind him. Gingerly, he put his hand to the back of his head and winced at the new pain to be added to his collection. His fingers came away sticky with blood. He grabbed his cap and feeling slightly sick and more than a little dizzy, carefully got to his feet. He stumbled rather than climbed out of the hatchway and fell into the snow, gasping as the icy air hit his lungs. He sat up slowly, head pounding like a steam hammer. He got up and stumbled over to where the blown hatch lay. Laboriously, he dragged it back to the wreck and finally, after several attempts, managed to place it over the hatchway. At least now, he reasoned, Destiny would stay reasonably warm until he could bring back some help. Still panting from his exertions, Blue looked around him at the valley floor. Apart from the wreckage of the helicopter, there were no signs of life in the valley. He looked higher up the hillside. Above him, he could see the lights of a building. Maybe he could find help there. Full of hope, he began the long, painful walk. “Captain Blue, come in Captain Blue.” Lieutenant Green was becoming worried. The helicopter was twenty minutes late already and there had been no message from either Captain Blue or Destiny Angel. Anxiously, he switched to the frequency allocated to the Emergency Locator Beacon, fitted to all Spectrum vehicles. Not a whisper. Obviously something was wrong. Quickly, he opened a channel to Colonel White. Colonel White stood gazing intently from the window. The flashing of his epaulettes, accompanied by a high pitched bleeping and his cap microphone dropping down into position alerted him that Lieutenant Green was calling him. “Go ahead Lieutenant Green,” White replied into the microphone. “What about the Emergency Locator Beacon?” asked White. Rhapsody and Symphony dashed across to their seats, picking up their helmets as they ran. As soon as they were seated, Hatches closed in front of them and their seats were quickly lifted up into the remaining two Angel aircraft, still clamped to the flight deck. As soon as the seats had locked in position, the clear injector tubes retracted into the deck. Like Angel One before them, they throttled up to full power before being launched along the deck and into the air. Within seconds they had climbed away from Cloudbase and joined Angel One. “S. I. G.,” acknowledged each girl in turn before banking and descending to begin the search. Powerful radar, housed in the needle-like prows of their aircraft probed far ahead of them looking for the smallest sign of their friends. Even so, it would still take hours to find one small helicopter in the mountainous terrain beneath them. Captain Blue was exhausted by the time he reached the chalet. The walk had been longer and the hillside steeper than he’d thought. The deep snow had made every step difficult. He was light-headed with concussion and the pain from his ankle. The chalet was quite large, of classic Swiss design, its snow-covered roof clamped tightly down. A welcoming light glowed warmly over the front door and a gentle stream of smoke issued from the chimney. Captain Blue smiled to himself as he approached the door. He’d be glad to sit down and warm himself by the fire and then ask the occupants if he could call for an ambulance for Destiny. Grasping the heavy iron knocker, Blue rapped on the door. “Good evening,” began Blue, “my helicopter has crashed in the valley and I wonder if I might…” His voice tailed off as he recognised Grayson’s face as the Senator opened the door. Blue turned to run but his foot slipped on a patch of ice. He yelped as his ankle gave way under him and he crashed to the ground, groaning. His cap lay disregarded where it had fallen in a pool of shadow. Blue could only struggle weakly as Grayson first removed his gun and then half dragged him inside. Leaving Blue on the sofa, Grayson telephoned for the police. Blue struggled to get up, but the pain from his ankle was too great. He sank back on the sofa as Grayson loomed over him. “Well, my Spectrum friend,” he sneered, “it looks as if you will be standing trial after all.” He put his head back and laughed. The Plan could not possibly fail now. For want of anything better to do, Colonel White stood at the window, gazing at the outside world. The airport traffic was much less now and would soon cease altogether as the airport closed down for the night. Already, many of the smaller hangars were in darkness. Soon the rest would follow. An Intercontinental Airlines Stratojet, the last few passengers having boarded, waited for the passenger terminal walkways to retract before slowly taxiing out across the apron and turning onto the end of the runway. This late at night, take off permission was immediately granted and it began to roll along the runway, its brilliant take-off lights cutting a swathe through the darkness in front of it. Soon the nosewheels lifted, followed by the main undercarriage and the huge bulk of the aircraft was airborne. Soon it had disappeared from view. Colonel White was hungry. He hadn’t eaten since he’d left Cloudbase, seemingly an eternity ago. On the table behind him a tray of food lay untouched. Even though the poisoned meal, along with the unfortunate Nielsen’s body, had been taken away for examination, he had no intention of risking the same fate. With a click, the door was unlocked and pushed open. A squad of six armed guards entered followed by the Guard Commander. “I see,” replied White levelly. “I understand, Sergeant,” replied White, “but are those really necessary?” he asked, indicating the handcuffs swinging from each guard’s belt. With all the dignity he could muster, Colonel White shook the sergeant’s hand free. “I am quite capable of making my own way, thank you,” White rebuked him crossly. “Sorry sir,” apologised the sergeant. He was about to lead the way when he noticed White’s Cap. “I’m sorry sir, I must ask you to give me your cap,” he said. White fumed and finally handed it over. “Thank you sir,” smiled the sergeant, leading the way. White fumed and then, followed by the guards, left the room. The Police arrived within minutes and formally charged a still muzzy Captain Blue with treason. After a police Surgeon had cleaned and dressed the worst of his cuts, he was bundled unceremoniously into a police van and driven away. Indeed, at that moment, the crew of the police helijet had spotted the wreckage of the Spectrum helicopter. Whilst the observer relayed its position to headquarters, the pilot brought the helijet in to land beside the wreck. The powdery snow erupted upwards under the blast from the vertical jets and the helijet was momentarily enveloped in a white cloud. As the pilot set the engines to idle, the observer leaped out and ran across to the wreck. He clambered inside and checked the occupants. The girl, he decided, would be o. k., but the Spectrum captain would never be o.k. again. He was cold to the touch and there was no sign of a heartbeat. He heard a sound from the cockpit and went to investigate. “Where is Captain Blue?” she asked hesitantly, fearing the worst. “He’s being taken care of miss,” the officer reassured her. “He went to get help.” He opened the first aid kit he was carrying and started to dress the wound. “You’re lucky,” he informed her. “It was only a flesh wound.” He finished applying the dressing and closed the case. “Merci.” Destiny thanked him with a smile. The smile soon disappeared when she saw his face. Destiny was too shocked to reply. Silently, she let herself be led to the waiting helijet where she waited whilst Scarlet’s body was collected and loaded aboard. Mission complete, the Helijet lifted gently into the air and set course for Geneva, leaving the wreck of the helicopter like a discarded toy in the snow. been so sure that he’d be able to have the answer within, at most, half an hour, that he’d started work. Since then, he’d carried out every test in the book and each one had been negative. Harvey sighed. This would mean more work, writing this lot up for the medical journals. He looked at his watch. Eleven fifteen. He was tempted to leave it until the morning, then thought better of it. He was so late now that another half hour wasn’t going to make much difference. The dinner party he was supposed to have gone to would have finished by now. Sadly he set to work. The report, strangely enough, caused him less trouble than the post mortem. Basically, he just had to sort the results into a coherent form, write up some background notes and a covering letter to the editor. He waited for the last sheet to come out of the printer, signed it with a flourish and stood up. That was finally it, he told himself, he was definitely going home this time. He took off his lab coat just as the door was pushed open by a hospital porter, whistling to himself and wheeling in a large trolley. On the trolley was a blanket-shrouded form. “Right y’are then,” the porter replied, lifting the body onto the slab. “Right then,” he said. “I’ll see you in the morning.” With that, he wheeled his trolley out of the door. His tuneless whistling echoed down the empty corridor. With that, he let the shroud fall back over the corpse’s head, picked up his coat and hat from the coat hook behind the door and left, wondering what excuse he could give his wife THIS time. Angel Two banked gently round and commenced another sweep. For what must have been hours, the aircraft criss-crossed the search area. Ultra-sensitive instruments, mounted in the nosecone of each aircraft, probed for the smallest clue as to the position of the missing helicopter. Rhapsody Angel pulled back slightly on her control column. Obediently, her aircraft rose over an approaching ridge. Once clear of the obstacle, she pushed gently forward and the aircraft swept down into a snow filled valley. Rhapsody yawned. It had been a long night At that moment, her radar contacted something small and metallic on the valley floor. As she got closer she was finally able to identify the object. She turned for a second look. There was no doubt about it. “S. I. G.,” Lieutenant Green acknowledged cheerfully. He pressed a switch, opening a channel to all the Angels. “All Angels return to Cloudbase.”, He waited to receive an acknowledgement from each girl in turn before opening a channel to Captains Grey and Ochre, waiting patiently in a Spectrum helicopter down on the flight deck. “S. I. G.,” acknowledged Grey, starting the helicopter’s engines. Soon the Helicopter had lifted off from Cloudbase and set course on its errand of mercy. Within minutes, flying at maximum speed, the three Angel aircraft swooped out of the darkness. One by one, they approached the flight deck and prepared to land, decelerating by means of retro rockets and adopting a nose-high attitude. Whilst this happened, the launch deck rose gently on hydraulic rams to meet the incoming aircraft. As soon as each aircraft made contact, clamps engaged, locking it to the deck which then gently descended once more. Within a minute, Rhapsody and Symphony were once more in the Amber Room below. Harmony, as lead Angel, once more waited in her aircraft. A shaft of moonlight streamed through the window of the dark, deserted mortuary and fell upon the shrouded figure on the slab, illuminating it in a ghostly white light. The ghost analogy was even more apt as the figure sat bolt upright. 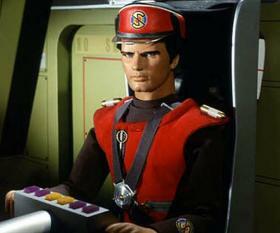 The shroud fell away from Captain Scarlet’s face and he looked around him. “Obviously not Cloudbase,” he mused. “I wonder where I am.” He shivered and realised he was naked under the shroud. Pulling it tighter for warmth, he looked around him. On the coat hook behind the door, he saw Harvey’s Lab Coat. “Better than nothing, I suppose.” thought Scarlet to himself, trying it on. The result was a far from perfect fit, Scarlet was at least six inches taller than the doctor, but at least he wouldn’t be quite so conspicuous but his bare feet might arouse some comment. Fortunately, there were some overshoes, also behind the door. The corridor outside, though brightly illuminated was deserted, as Scarlet found when he cautiously peered outside. Then he noticed a sign on the door opposite: PATHOLOGY LABORATORY. So, he was in hospital, though how he came to be there instead of Cloudbase Sickbay was still a mystery. Picking a direction more-or-less at random, he walked cautiously up the corridor. As luck would have it, the first door he came across bore the legend: MALE LOCKERS. Perhaps he’d be able to find some clothes in there. Gently, he pushed the door open and peered inside. The room was in darkness. He entered and closed the door behind him. Finding the light switch, he turned it on and started to rummage through the lockers. Of his own uniform, there was no sign, but he managed to find a passable suit and shoes. He looked at the now discarded Lab coat. It would make a pretty good disguise in a hospital. Someone walking the corridors this late at night was bound to be questioned by an inquisitive nurse. But not, he reasoned, if that person were, or at least appeared to be, a doctor. The coat he’d ‘borrowed’ was far too small. He’d just have to find another. Another few minutes of looking through the lockers turned up a lab coat of the right size. Scarlet put it on and stepped out into the corridor.